7 Chapter 7: Does IT Matter? describe information systems that can provide businesses with competitive advantage. For over fifty years, computing technology has been a part of business. Organizations have spent trillions of dollars on information technologies. But has all this investment in IT made a difference? Have we seen increases in productivity? Are companies that invest in IT more competitive? In this chapter, we will look at the value IT can bring to an organization and try to answer these questions. We will begin by highlighting two important works from the past two decades. 4) Mismanagement of information and technology. In 1998, Brynjolfsson and Lorin Hitt published a follow-up paper entitled “Beyond the Productivity Paradox.” In this paper, the authors utilized new data that had been collected and found that IT did, indeed, provide a positive result for businesses. Further, they found that sometimes the true advantages in using technology were not directly relatable to higher productivity, but to “softer” measures, such as the impact on organizational structure. They also found that the impact of information technology can vary widely between companies. Just as a consensus was forming about the value of IT, the Internet stock market bubble burst. Just two years later, in 2003, Harvard professor Nicholas Carr wrote his article “IT Doesn’t Matter” in the Harvard Business Review. In this article Carr asserts that as information technology has become more ubiquitous, it has also become less of a differentiator. In other words: because information technology is so readily available and the software used so easily copied, businesses cannot hope to implement these tools to provide any sort of competitive advantage. Carr goes on to suggest that since IT is essentially a commodity, it should be managed like one: low cost, low risk. Using the analogy of electricity, Carr describes how a firm should never be the first to try a new technology, thereby letting others take the risks. IT management should see themselves as a utility within the company and work to keep costs down . For IT, providing the best service with minimal downtime is the goal. As you can imagine, this article caused quite an uproar, especially from IT companies. Many articles were written in defense of IT; many others in support of Carr. Carr released a book based on the article in 2004, entitled Does IT Matter? Click here to watch a video of Carr being interviewed about his book on CNET. Probably the best thing to come out of the article and subsequent book was that it opened up discussion on the place of IT in a business strategy, and exactly what role IT could play in competitive advantage. It is that question that we want to address in the rest of the this chapter. What does it mean when a company has a competitive advantage? What are the factors that play into it? While there are entire courses and many different opinions on this topic, let’s go with one of the most accepted definitions, developed by Michael Porter in his book Competitive Advantage: Creating and Sustaining Superior Performance. A company is said to have a competitive advantage over its rivals when it is able to sustain profits that exceed average for the industry. According to Porter, there are two primary methods for obtaining competitive advantage: cost advantage and differentiation advantage. So the question becomes: how can information technology be a factor in one or both of these methods? In the sections below we will explore this question using two of Porter’s analysis tools: the value chain and the five forces model. We will also use Porter’s analysis in his 2001 article “Strategy and the Internet,” which examines the impact of the Internet on business strategy and competitive advantage, to shed further light on the role of information technology in competitive advantage. In his book, Porter describes exactly how a company can create value (and therefore profit). Value is built through the value chain: a series of activities undertaken by the company to produce a product or service. Each step in the value chain contributes to the overall value of a product or service. While the value chain may not be a perfect model for every type of company, it does provide a way to analyze just how a company is producing value. The value chain is made up of two sets of activities: primary activities and support activities. We will briefly examine these activities and discuss how information technology can play a role in creating value by contributing to cost advantage or differentiation advantage, or both. Inbound logistics: These are the functions performed to bring in raw materials and other needed inputs. Information technology can be used here to make these processes more efficient, such as with supply-chain management systems, which allow the suppliers to manage their own inventory. Operations: Any part of a business that is involved in converting the raw materials into the final products or services is part of operations. From manufacturing to business process management (covered in chapter 8), information technology can be used to provide more efficient processes and increase innovation through flows of information. Outbound logistics: These are the functions required to get the product out to the customer. As with inbound logistics, IT can be used here to improve processes, such as allowing for real-time inventory checks. IT can also be a delivery mechanism itself. Sales/Marketing: The functions that will entice buyers to purchase the products are part of sales and marketing. Information technology is used in almost all aspects of this activity. From online advertising to online surveys, IT can be used to innovate product design and reach customers like never before. The company website can be a sales channel itself. Service: The functions a business performs after the product has been purchased to maintain and enhance the product’s value are part of the service activity. Service can be enhanced via technology as well, including support services through websites and knowledge bases. Firm infrastructure: This includes organizational functions such as finance, accounting, and quality control, all of which depend on information technology; the use of ERP systems (to be covered in chapter 9) is a good example of the impact that IT can have on these functions. Human resource management: This activity consists of recruiting, hiring, and other services needed to attract and retain employees. Using the Internet, HR departments can increase their reach when looking for candidates. There is also the possibility of allowing employees to use technology for a more flexible work environment. Technology development: Here we have the technological advances and innovations that support the primary activities. These advances are then integrated across the firm or within one of the primary activities to add value. Information technology would fall specifically under this activity. Procurement: The activities involved in acquiring the raw materials used in the creation of products and services are called procurement. Business-to-business e-commerce can be used to improve the acquisition of materials. This analysis of the value chain provides some insight into how information technology can lead to competitive advantage. Let’s now look at another tool that Porter developed – the “five forces” model. Porter developed the “five forces” model as a framework for industry analysis. 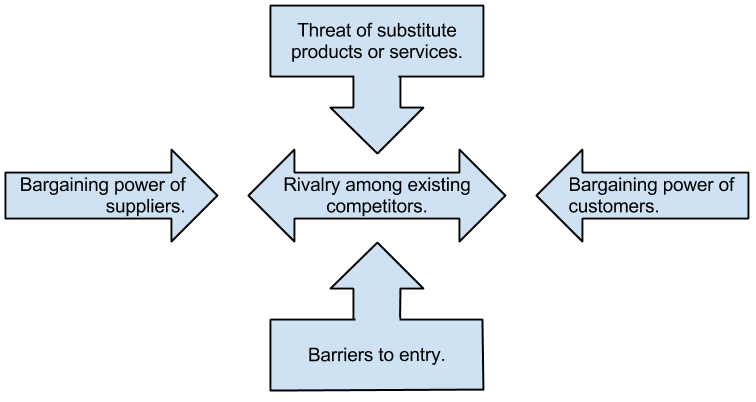 This model can be used to help understand just how competitive an industry is and to analyze its strengths and weaknesses. The model consists of five elements, each of which plays a role in determining the average profitability of an industry. In 2001, Porter wrote an article entitled “Strategy and the Internet,” in which he takes this model and looks at how the Internet impacts the profitability of an industry. Below is a quick summary of each of the five forces and the impact of the Internet. Threat of substitute products or services: How easily can a product or service be replaced with something else? The more types of products or services there are that can meet a particular need, the less profitability there will be in an industry. For example, the advent of the mobile phone has replaced the need for pagers. The Internet has made people more aware of substitute products, driving down industry profits in those industries being substituted. Bargaining power of suppliers: When a company has several suppliers to choose from, it can demand a lower price. When a sole supplier exists, then the company is at the mercy of the supplier. For example, if only one company makes the controller chip for a car engine, that company can control the price, at least to some extent. The Internet has given companies access to more suppliers, driving down prices. On the other hand, suppliers now also have the ability to sell directly to customers. Bargaining power of customers: A company that is the sole provider of a unique product has the ability to control pricing. But the Internet has given customers many more options to choose from. Barriers to entry: The easier it is to enter an industry, the tougher it will be to make a profit in that industry. The Internet has an overall effect of making it easier to enter industries. It is also very easy to copy technology, so new innovations will not last that long. Rivalry among existing competitors: The more competitors there are in an industry, the bigger a factor price becomes. The advent of the Internet has increased competition by widening the geographic market and lowering the costs of doing business. For example, a manufacturer in Southern California may now have to compete against a manufacturer in the South, where wages are lower. Porter’s five forces are used to analyze an industry to determine the average profitability of a company within that industry. Adding in Porter’s analysis of the Internet, we can see that the Internet (and by extension, information technology in general) has the effect of lowering overall profitability. While the Internet has certainly produced many companies that are big winners, the overall winners have been the consumers, who have been given an ever-increasing market of products and services and lower prices. Following are some examples of information systems that fall into this category. In their book, IT Doesn’t Matter – Business Processes Do, Howard Smith and Peter Fingar argue that it is the integration of information systems with business processes that leads to competitive advantage. They then go on to state that Carr’s article is dangerous because it gave CEOs and IT managers the green light to start cutting their technology budgets, putting their companies in peril. They go on to state that true competitive advantage can be found with information systems that support business processes. In chapter 8 we will focus on the use of business processes for competitive advantage. One of the ways that information systems have participated in competitive advantage is through integrating the supply chain electronically. This is primarily done through a process called electronic data interchange, or EDI. 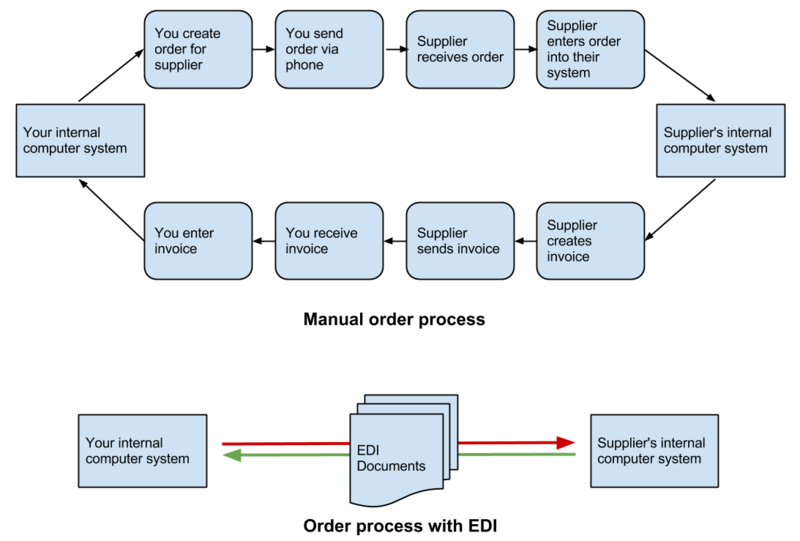 EDI can be thought of as the computer-to-computer exchange of business documents in a standard electronic format between business partners. By integrating suppliers and distributors via EDI, a company can vastly reduce the resources required to manage the relevant information. Instead of manually ordering supplies, the company can simply place an order via the computer and the next time the order process runs, it is ordered. As organizations began to implement networking technologies, information systems emerged that allowed employees to begin collaborating in different ways. These systems allowed users to brainstorm ideas together without the necessity of physical, face-to-face meetings. Utilizing tools such as discussion boards, document sharing, and video, these systems made it possible for ideas to be shared in new ways and the thought processes behind these ideas to be documented. Google Drive. Google Drive offers a suite of office applications (such as a word processor, spreadsheet, drawing, presentation) that can be shared between individuals. Multiple users can edit the documents at the same time and threaded comments are available. Microsoft SharePoint. SharePoint integrates with Microsoft Office and allows for collaboration using tools most office workers are familiar with. SharePoint was covered in more detail in chapter 5. Cisco WebEx. WebEx is a business communications platform that combines video and audio communications and allows participants to interact with each other’s computer desktops. WebEx also provides a shared whiteboard and the capability for text-based chat to be going on during the sessions, along with many other features. Mobile editions of WebEx allow for full participation using smartphones and tablets. Atlassian Confluence. Confluence provides an all-in-one project-management application that allows users to collaborate on documents and communicate progress. The mobile edition of Confluence allows the project members to stay connected throughout the project. IBM Lotus Notes/Domino. One of the first true “groupware” collaboration tools, Lotus Notes (and its web-based cousin, Domino) provides a full suite of collaboration software, including integrated e-mail. A decision support system (DSS) is an information system built to help an organization make a specific decision or set of decisions. DSSs can exist at different levels of decision-making with the organization, from the CEO to the first-level managers. These systems are designed to take inputs regarding a known (or partially-known) decision-making process and provide the information necessary to make a decision. DSSs generally assist a management-level person in the decision-making process, though some can be designed to automate decision-making. An organization has a wide variety of decisions to make, ranging from highly structured decisions to unstructured decisions. A structured decision is usually one that is made quite often, and one in which the decision is based directly on the inputs. With structured decisions, once you know the necessary information you also know the decision that needs to be made. For example, inventory reorder levels can be structured decisions: once our inventory of widgets gets below a specific threshold, automatically reorder ten more. Structured decisions are good candidates for automation, but we don’t necessarily build decision-support systems for them. An unstructured decision involves a lot of unknowns. Many times, unstructured decisions are decisions being made for the first time. An information system can support these types of decisions by providing the decision-maker(s) with information-gathering tools and collaborative capabilities. An example of an unstructured decision might be dealing with a labor issue or setting policy for a new technology. Decision support systems work best when the decision-maker(s) are making semi-structured decisions. A semi-structured decision is one in which most of the factors needed for making the decision are known but human experience and other outside factors may still play a role. A good example of an semi-structured decision would be diagnosing a medical condition (see sidebar). As with collaborative systems, DSSs can come in many different formats. A nicely designed spreadsheet that allows for input of specific variables and then calculates required outputs could be considered a DSS. Another DSS might be one that assists in determining which products a company should develop. Input into the system could include market research on the product, competitor information, and product development costs. The system would then analyze these inputs based on the specific rules and concepts programmed into it. Finally, the system would report its results, with recommendations and/or key indicators to be used in making a decision. A DSS can be looked at as a tool for competitive advantage in that it can give an organization a mechanism to make wise decisions about products and innovations. First, the data show that IT has sharpened differences among companies instead of reducing them. This reflects the fact that while companies have always varied widely in their ability to select, adopt, and exploit innovations, technology has accelerated and amplified these differences. Second, good management matters: Highly qualified vendors, consultants, and IT departments might be necessary for the successful implementation of enterprise technologies themselves, but the real value comes from the process innovations that can now be delivered on those platforms. Fostering the right innovations and propagating them widely are both executive responsibilities – ones that can’t be delegated. Finally, the competitive shakeup brought on by IT is not nearly complete, even in the IT-intensive US economy. We expect to see these altered competitive dynamics in other countries, as well, as their IT investments grow. Information systems can be used for competitive advantage, but they must be used strategically. Organizations must understand how they want to differentiate themselves and then use all the elements of information systems (hardware, software, data, people, and process) to accomplish that differentiation. Information systems are integrated into all components of business today, but can they bring competitive advantage? Over the years, there have been many answers to this question. Early research could not draw any connections between IT and profitability, but later research has shown that the impact can be positive. IT is not a panacea; just purchasing and installing the latest technology will not, by itself, make a company more successful. Instead, the combination of the right technologies and good management, together, will give a company the best chance of a positive result. How is the 2008 study by Brynjolfsson and McAfee different from previous studies? How is it the same? What does it mean for a business to have a competitive advantage? What are the primary activities and support activities of the value chain? What has been the overall impact of the Internet on industry profitability? Who has been the true winner? Give an example of a semi-structured decision and explain what inputs would be necessary to provide assistance in making the decision. What does a collaborative information system do? 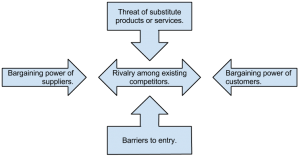 How can IT play a role in competitive advantage, according to the 2008 article by Brynjolfsson and McAfee? Do some independent research on Nicholas Carr (the author of “IT Doesn’t Matter”) and explain his current position on the ability of IT to provide competitive advantage. Review the WebEx website. What features of WebEx would contribute to good collaboration? What makes WebEx a better collaboration tool than something like Skype or Google Hangouts? Think of a semi-structured decision that you make in your daily life and build your own DSS using a spreadsheet that would help you make that decision.